Author and literary critic Jules Chametzky '50 releases cultural memoir about a generation of the borough's legendary Jewish writers, from Isaac Bashevis Singer to Grace Paley. 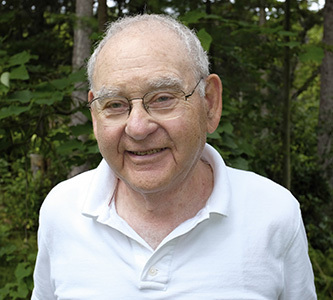 Jules Chametzky '50, has enjoyed a renowned career as a writer, editor, and literary critic. A few years ago, he decided to write a personal biography about his life and his roots growing up in Brooklyn. "I wrote about 20 pages and I got bored," he says. So instead, he ended up churning out a book about other writers whose careers intersected with his. After all, it was a career that included brushes—some intimate, some brief—with many of the most influential Jewish writers of a generation. Make no mistake, Chametzky is name dropping in Out of Brownsville: Encounters with Nobel Laureates and Other Jewish Writers (Meredith Winter Press, 2012). Those names include some Brooklyn College luminaries, notably former Distinguished Professor Allen Ginsberg, and alums Morty Gunty '53, and Howard Sackler '50. Chametzky spins yarns about more than 40 writers, and includes cameos from some non-Jewish literary stars like Amiri Baraka, and Chametzky's friends James Baldwin and Jose Yglesias. "I limited it to people whom I had met, even if only for 15 minutes," he says. "People who had a big impact on me." The co-founder and editor emeritus of the Massachusetts Review and a former English professor at the University of Massachusetts, Amherst says he has known more than 100 writers in his career. He calls the book an "effort to counteract the cultural amnesia that has become fairly common in the twilight days of print and literature." The stories have a real inside baseball feel when he talks about bringing Ginsberg to Amherst for the only time he would meet James Baldwin; or when he mentions that Isaac Bashevis Singer, in his twilight, mistook Chametzky for the actor and screenwriter Paul Mazursky '51, one of Chametzky's former neighbors and a fellow student at Brooklyn College, when Chametzky attended. "It turned out to be an interesting exercise for myself," he says. "I included some really meaningful experiences. The book pleases me. It was a joie d'esprit. I wanted it to be educational in a sense but also entertaining." After teaching for 52 years, including positions at seven different European universities, Chametzky now lectures occasionally and is a consultant for a few university presses. Still active at age of 85, he will be in New York City on October 6 and 7 for two readings from his book, which has just been published in paperback (University of Massachusetts Press, 2013). The first is at the Eldridge Street Museum on Sunday, October 6 at 3 p.m. and the second is at The New School at 4 p.m. in a class on Jewish literature taught by Professor of Religion and Comparative Literature Val Vinokurv. Additional readings are scheduled for October 20 at the Jewish Community of Amherst, at 3 p.m., and at the Odyssey Bookstore in South Hadley, Mass., at 7 p.m.